This book develops a novel and simple, yet rigorous methodology that, by means of basic techniques and tools available to any engineer, enables the study of solar concentrator performance parameter scattering on the control of the solar field outlet temperature. Several simulations are performed considering a realistic solar field comprised of a large set of solar collectors with slight differences in performance. Sets of scattered parameter distributions are randomly assigned to the collectors in the solar field. Sensitivity analysis of solar field behavior is then performed in terms of the distribution of the performance parameters of the solar collectors, followed by a comparison between different configurations of the solar field according to the number of subfields. The latter is of great interest in order to evaluate the effect of a subfield number on the ability of the solar field’s operator to control the temperature of the solar field when a flow control valve is not available in each loop. 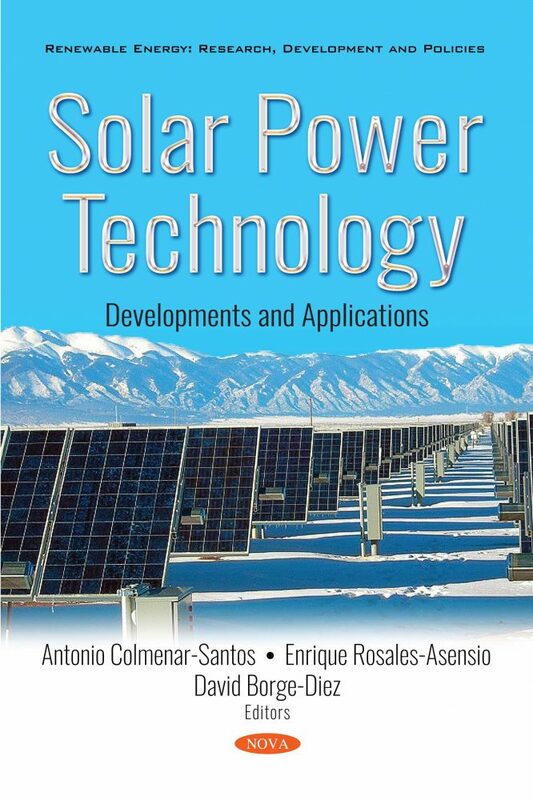 As a special feature, this book proposes a new model for characterizing the energetic behavior of grid connected PV inverters. 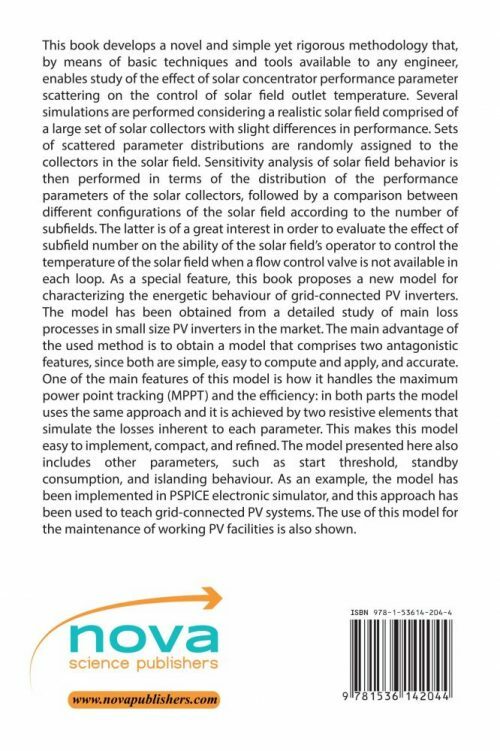 The model has been obtained from a detailed study of the main loss processes in small size PV inverters in the market. The main advantage of the used method is to obtain a model that comprises two antagonistic features, since both are simple, easy to compute and apply, and accurate. One of the main features of this model is how it handles the maximum power point tracking (MPPT) and its efficiency: Concerning both parts, the model uses the same approach and is achieved by two resistive elements which simulate the losses inherent to each parameter. This makes this model easy to implement, compact and refine. The model presented here also includes other parameters, such as the start threshold, standby consumption and islanding behavior. As an example, the model has been implemented in the PSPICE electronic simulator, and this approach has been used to teach grid-connected PV systems. The use of this model for the maintenance of working PV facilities is also shown.